PHOENIX — In our quest for a silver lining, let’s play the R&R card. Goran Dragic certainly could use some rest and relaxation. After filling the rock-star role for host nation Slovenia during last summer’s Eurobasket tournament, the Suns point guard has been the on-court catalyst for a team that continues to amaze the NBA. Having gunned in 58 points during the last two games of a 4-0 road trip, The Dragon’s rise has enabled the Suns to return home at 28-18, sitting on the sixth seed in the Western Conference. So it’s five more games before an All-Star Weekend that will occur without participation from the 27-year-old Dragic. The first-time father was bypassed when Western Conference reserves were announced Thursday night and will not become a first-time All-Star during the same season. At least he’ll have an entire weekend to spend with Mateo, his baby boy, unless he’s called upon to serve as an injury replacement. "I’m going to be the happiest guy on the planet if that happens," Dragic said Thursday night, "but if not, I’m going to have five days off, so that’s going to help me, too." While it seems easy to make a case for Dragic’s inclusion and also not difficult to understand the machinations of his snubbing, there are more compelling, Dragon-related issues to ponder than a spot on the All-Star team. We can begin with drum beats from league reporters regarding his status as a Most Improved Player candidate. As presented in The Starting Five rundown on this website, Dragic has made remarkable jumps in points and efficiency without much of an increase in playing time. Most players under MIP consideration have their cases abetted by considerable hikes in on-court burn. But this judgment of Dragic’s improvement is less important than our task to figure out where to install the beams for his proverbial ceiling. Before entering expert testimony, let’s take a look at what’s been going on in the last month. January began with an Eric Bledsoe injury, which deprived the Suns of half ove their dynamic point-guard tandem and required Dragic into fulltime responsibilities running the offense. Phoenix has been a relatively mediocre 9-7 since Bledsoe injured his knee in a noisy road rout of the Los Angeles Clippers. But the nine the recently concluded four-game road sweep (in five nights, no less) and a pair of victories over the mighty Indiana Pacers. Suns spots: Who are the difference makers? In these 16 games, Dragic has averaged 22.3 points while making 52 percent of his shots from the field. His 3-point percentage in January is a blistering 46. "He’s been smart about the shots," Suns coach Jeff Hornacek said. "We tell the guys just play within the game. That’s what he’s been doing. And when he shoots, he expects to make it." Dragic certainly is making shot with more regularity than he did while under the microscope for the Slovenian national team. As its ranking NBA-conscripted superstar, Goran’s 15.8 points per game were accomplished while shooting under 40 percent (39.4) from the field overall and 26.7 percent from behind the arc. Without Bledsoe to help keep opposing defenses from loading up on one facilitator, Dragic’s productivity against NBA defenses seems pretty remarkable. For statistical context, note that Dragic is one of three NBA players averaging at least 19 points and 5 assists while shooting 48 percent or higher. His peers on this short list are LeBron James and Kevin Durant. OK, so we’re not close to pushing Dragic anywhere near such an elite overall level. But we are wondering how much more he can improve. And while we’re at it, Dragic’s command performance in January is making a lot of basketball folks wonder what will or should happen when Bledsoe returns. For outside perspective, we’re going with expertise from an assistant coach employed by another Western Conference team. 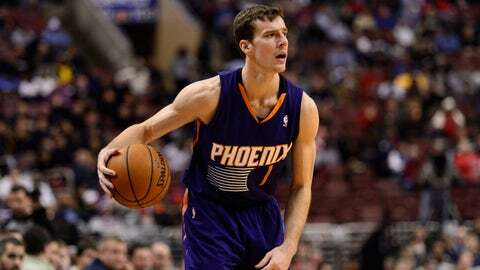 "Honestly, he’s beyond what I thought he’d do in this league," the coach said of where Dragic is right now. "I always thought he was just a streaky guy because he shot it kind of sporadically, played out of control at times and was just a so-so passer. "I think the coaching change has helped him become more patient or at least selective in half-court situations. Since he plays in Phoenix, there was this tendency to say he can’t create scoring situations for teammates like (Steve) Nash … but who can? And the success he’s had shooting 3s could be all hard work from him or something one of the coaches noticed. But with his speed and quickness, if he keeps making shots, he’ll be even harder to defend." According to the numbers crunched by hoopsstats.com, Dragic checks in seventh for efficiency among all NBA point guards with a rating of 19.9. Denver’s Ty Lawson is sixth at 20.0. The reverse pecking order has Toronto’s Kyle Lowry at five, Russell Westbrook of Oklahoma City at four, Washington’s John Wall at three, Steph Curry of Golden State at two and Clipper Chris Paul first at 26.9. For the record, Bledsoe is eighth at 18.9. When asked for an opinion on the Suns’ future with Dragic, Bledsoe, a big contract and the task of keeping two full-time point guards occupied, our expert offered limited insight. "There are so many variables to consider," he said. "How healthy will he (Bledsoe) be? How effective will he be if he plays again this season? How will the free-agent market react? How much are the Suns willing to pay to keep him? 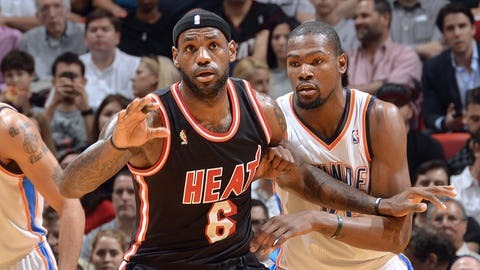 All I know is having both of those guys on the floor makes it a nightmare to prepare for them defensively." But with Bledsoe out, the Suns have climbed to sixth in points per game and eighth in offensive efficiency. They have scored 124 or more points three times in the last six games. They also won 10 of their last 12 games with Bledsoe and Dragic working together. For those wondering about his effectiveness playing off the ball, Dragic did produce 26 points alongside Bledsoe in that win over the Clippers. While local critics seem eager for the Suns to settle on one point guard (usually Dragic) and apply the money needed to rehire Bledsoe elsewhere, Goran’s perspective may be the way to go. "We both make it easier on each other when we’re out there," he said before Bledsoe was injured. "That makes it harder for the other team."